Please scroll down to see images of The Tracy Silk Blouse modeled and in greater detail. We invite you to visit the links directly below, as well. Inspired by: The Philadelphia Story (1940) and High Society (1956). Material: Without a tag I cannot be certain, but it feels like acetate. Closure: Fabric-covered buttons, with an additional metal snap closure at the bottom of the button line. The cuffs each have two buttons, which are the same size as the buttons on the front. There is a 1/4" spot on the collar and a very minor spot on the center button. Both marks are detailed in the images below. There was an approximately 2" area along the left arm seam that had come undone and has since been repaired by hand. The hand stitching is only visible along the inside. 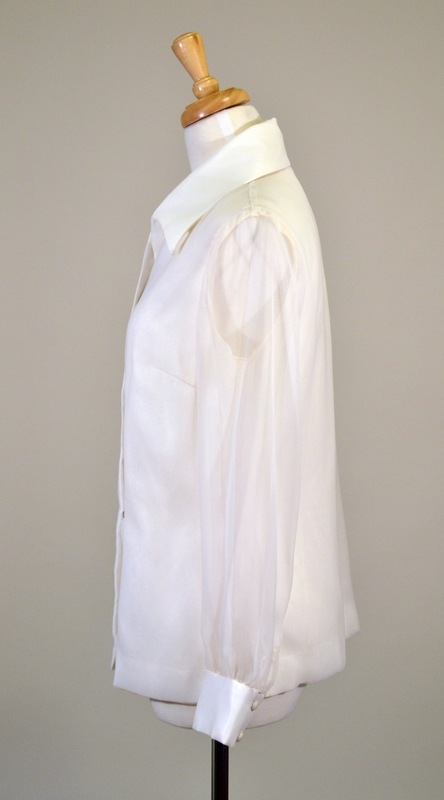 The blouse features two snaps along each shoulder seam that can be used to secure a bra strap or the hanger. They were likely used to secure shoulder pads that are no longer attached and, unfortunately, unavailable. A fantastic piece to be dressed up or down. Look stunning at the office, then change heels, and you're ready for a night out! Modeled by Kate. Skirt not included. Modeled by Myranda. Skirt not included. Front button and sleeve detail. 1/4" spot on left side of collar. Minor spot on center button.